I have a reading list a mile long, so the choice of my next book has lately been influenced by what’s been written about the book before I open it. This was the case with Their Eyes Were Watching God. The talk surrounding this book weighed heavily on it surfacing to the top of my list. What was the talk surrounding it? It’s an Alice Walker favorite, it is recommended college reading, it’s a Women’s Studies must in colleges both nationwide and the world over (I discovered why, but I’ll get to that), and Ralph Ellison, Hurston’s fellow Harlem Renaissance writer, spurned its debut (circa 1937). This last one most piqued my interest. 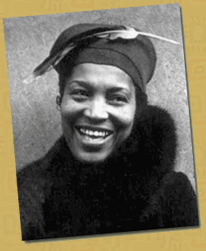 Zora Neale Hurston invites us in by telling, in mostly third person narrative, the story of protagonist Janie Crawford. We see Janie’s short lived pubescence as she is ushered by her fearful grandmother into an arranged marriage, the purpose of which is to circumvent any threat to her virtue. Although, Janie’s grandmother, Nanny, has a backstory that explains her fear, it still seems like overcompensation for something from which Janie is removed. While still a slave, Nanny was impregnated by her master and gave birth to Leafy. The two would have suffered a doomed fate under their vengeful mistress, but Nanny escaped with Leafy and was able to find her a home and a proper education. At age 17 however, Leafy was violently raped by her school teacher, after which Janie was born. Forever changed, Leafy lost herself to drinking and promiscuity. So, Janie became the vessel of reclaiming everything that had been stripped from the lives of Nanny and Leafy. Throughout the story we see how this manifests in more than just Nanny’s hope for Janie’s virtue, but in her hopefulness for Janie’s comfort and security as a woman (as much as could be experienced by the granddaughter of a former slave just one generation her senior). Hurston uses the character of Janie to illustrate burgeoning self-awareness, esteem, determination, and preservation (in that order). These things also draw parallels to the greater context of the Women’s Movement and are evident in this story’s popularity within Women’s Studies. Janie’s character creates her own brand of feminism by making choices antithetical to paradigms of this era and this setting; however, to her credit she owns them quite literally to the end. She claims her worth, dignity, and strength when she finally confronts Joe Starks, her second husband. Hurston builds up to this point over the course of several chapters by showing Joe’s growth in status measured equally in relation to his actions that diminish Janie. This builds to a point when Janie finally speaks up in self-defense; a moment well warranted and overdue. “’Looka heah, Brother Mayor, whut yo’ wife done took and done.’ It was cut comical, so everybody laughed at it. ‘Uh woman and uh knife, don’t b’long tuhgether.” There was some more good natured laughter at the expense of women. Jody didn’t laugh. He hurried across from the post office side and took the plug of tobacco away from Mixon and cut it again. Cut it exactly on the mark and glared at Janie. A big laugh started off in the store but people got to thinking and stopped. It was funny if you looked at it right quick, but it got pitiful if you thought about it awhile. It was like someone snatched off part of a woman’s clothes while she wasn’t looking and the streets were crowded. Then too, Janie took the middle of the floor to talk right into Jody’s face, and that was something that hadn’t been done before. ‘T’ain’t no use in getting’ all mad, Janie, ‘cause Ah mention you ain’t no young gal no mo’. Nobody in heah ain’t lookin for no wife outa yuh. Old as you is. ‘Wha—whut’s dat you said?’ Joe challenged, hoping his ears had fooled him. ‘You heard her, you ain’t blind,’ Walter taunted. ‘Ah ruther be shot with tacks than tuh hear dat ‘bout mahself,’ Lige Moss commiserated. This is a pivotal confrontation in which Joe’s flaccid attempt to exhort himself as Janie’s superior and more importantly to keep up appearances in front of the townsmen did nothing to mitigate Janie’s claim on her sense of “self.” He becomes ill after this showdown and refuses treatment from a medical doctor, opting instead for a conjurer and some sympathetic townsmen that sit as sentries, denying Janie access to his death bed. After his death, Janie takes another step toward reclaiming her sense of self by shedding her expected black mourning dress for a blue one. She does this because newcomer, Tea Cake (Vergible Woods), approximately 12 years her junior, fancies her in it. The two become fodder for gossip. By practical standards Tea Cake seems like a mismatch for Janie and she is insecure about submitting to this May/December relationship. Her trusted friend, Pheoby Watson, cautions her, but Janie chooses to follow her heart and her conviction that Tea Cake is what she needs to attain authenticity in love and life. Basically, she becomes more “herself” with Tea Cake. The two grow in love as Janie learns to trust herself and him. This is illustrated in their conversations with one another. So, Janie and Tea Cake leave Eatonville to make a new life together. Tea Cake finds seasonal work in the Florida Everglades (or the muck) with Janie by his side. Then Hurston places them in horrific danger; the Okeechobee Hurricane of 1928. 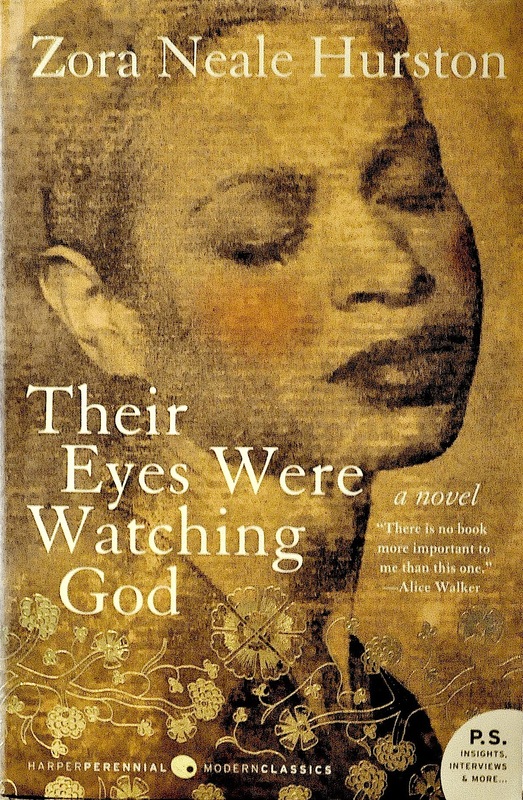 She emphasizes that “their eyes were watching God,” and adds credence to this prose with palpable descriptions of scene. Their Eyes Were Watching God, aptly the title of the book reminds us of events that had formed throughout Jamie’s story before each climax, like the clouds of an impending storm. She is watching, and each event has brought with it an outcome that Jamie could have never imagined. Each event has taught her of her potential for great resilience—as if, all she’s weathered has helped her find divinity within. When the hurricane hits, it sets off a chain of events that once again help Janie understand her own strength. Through nursing Tea Cake, through the rabid bite, the shooting, and finally the trial (where she is interestingly exonerated by white women), Janie discovers self-assuredness: her ultimate freedom. She does this without a man. This is possibly why Hurston’s work received little to no positive commentary from the predominantly male authors of the Harlem Renaissance, and only scathing commentary from Ralph Ellison. Ellison, while writing a tour de force that illuminated the travails of the invisible man, doubtfully considered the greatest part of him, the invisible woman and her symbiotic importance to true freedom. Enjoy the full experience as I have by listening to Their Eyes Were Watching God performed by actress Ruby Dee.